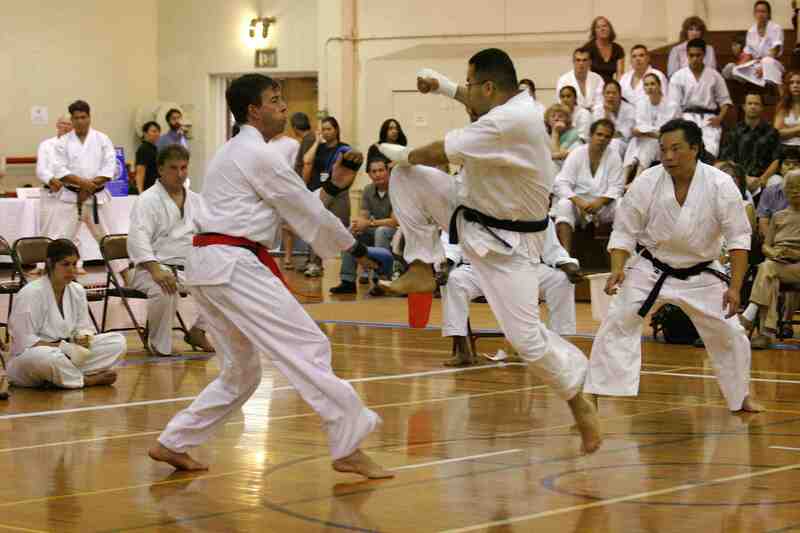 This year marks the 60th anniversary of the Annual Nisei Week Karate Exhibition and Tournament. The event is the oldest public karate demonstration in the United States, dating to 1956 when it was presented by Tsutomu Ohshima, chief instructor of Shotokan Karate of America (SKA), in conjunction with the founding of SKA that same year. Ohshima Sensei — one of the most highly regarded karate instructors in the world — is a direct pupil of Gichin Funakoshi, who introduced karate from Okinawa to mainland Japan in 1922. Ohshima Sensei was and continues to be the chief instructor of SKA. Under his leadership and guidance, SKA has spread the teachings of Master Funakoshi and traditional karate-do throughout the world for 60 years. According to Kei Teramoto, executive vice president of SKA, since its inception, the Nisei Week Exhibition has remained largely unchanged in content and format as the objective was to present karate to the general public in its traditional and pure form. The Nisei Week Karate Exhibition and Tournament will be held on Saturday, Aug. 13, from 11 a.m. to 1:30 p.m. at the Braun Gymnasium of Caltech, located at 1200 E. California Blvd. in Pasadena. The event is open to the public. Admission and parking are free. Doors will open at 10:30 a.m.
For additional information, call (213) 437-0988 or visit www.ska.org. SKA is a nationwide, non-profit organization dedicated to the teaching of traditional karate-do since 1955. SKA’s emphasis upon development of strength in mind and character through traditional and rigorous training has led to its popularity in this country.